You can use these keys to unlock texts in different ways. Use the menu on the left to learn more about each one. For instance, a knowledge of audience helps you suggest what the preferred reading might be, while knowing about genre helps you predict how a text will follow a pattern. There are many different ways to approach analysis of a media text. You can use the acronym MIRA to help your basic approach. M = Media Form: What is this? The first step in analysis involves naming what you are analysing. Is it a movie poster? The title sequence to a TV drama series? A music video? If it's a newpaper front page, how do you know? Is it advertising or promotion, made by a toy manufacturer or a pop band to promote their product? Is it critical, produced by a magazine, blog or newspaper as commentary on a product? Is it narrative? Does it tell a story in its own right, or does it promote highlights from a longer story (e.g. the trailer for a movie or TV show)? Describe what you are looking at, and say how and why it fits a particular Media Form. I = Institution: Who Made this? Your next step is to consider who constructed the text. Was it a big, powerful company with millions of dollars to command, or is it a small, local production, created on a shoestring? R = Representation: Who or What does this show? There are people and objects in here - how are they represented in both words and images? Is the representation positive or negative? Is it a stereotype or is it original? A = Audience: Who is this for? Every media text is made with someone in mind, whether it's a summer blockbuster movie aimed at all four quadrants, or a niche magazine aimed at Civil War re-enactment enthusiasts. Who do you think the preferred audience is for this text, and how do you think they are expected to interpret it? If it's an ad, will they buy the product? If it's a title sequence, will they keep watching? In order to analyse a media text using M-I-R-A you need to pay attention to the details, read the signs. This process is known as decoding and it has two parts, denotation (decoding the simple, surface meaning of a sign, which can usually only be done one way) and connotation (decoding the deeper meaning, this can vary from person to person). When we interpret signs, we usually use a combination of the two. The denotation of the sign is very simple: there is a figure of a walking man with a red line drawn across it, and then enclosed in a red circle. The connotation of the red circle and line is easy too: danger. Combine the red graphic with the figure of the man and you can conclude that it's forbidden to walk here because you will put yourself in danger or break some kind of rules. You've probably seen this kind of sign in lots of different places, and haven't really thought about how you know what it means. 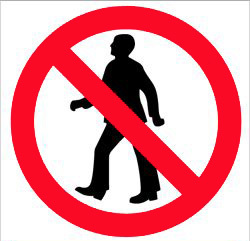 The preferred reading of this sign is "No Entry" or "No Pedestrians". Cars might be permitted in this area, but it would depend where the sign was placed. This is where the context of a sign becomes important, as it also contributes to the meaning. If this sign was placed in an area where the sexes were segregated, it could mean "No Men" or "Women Only". If it was used in a galaxy far away where lots of different alien species were wandering around, it could mean "No humans past this point". All these meanings are connotations suggested by deeper consideration of what the sign might mean, and a willingness to accept that the sign might have more than one meaning. Most media texts rely on a range of signs and symbols, all of which must be decoded to unlock the full meaning of the text. We're used to only spending a few seconds glancing at posters, ads, magazine front covers etc. Media Studies requires you to spend longer looking deeper.